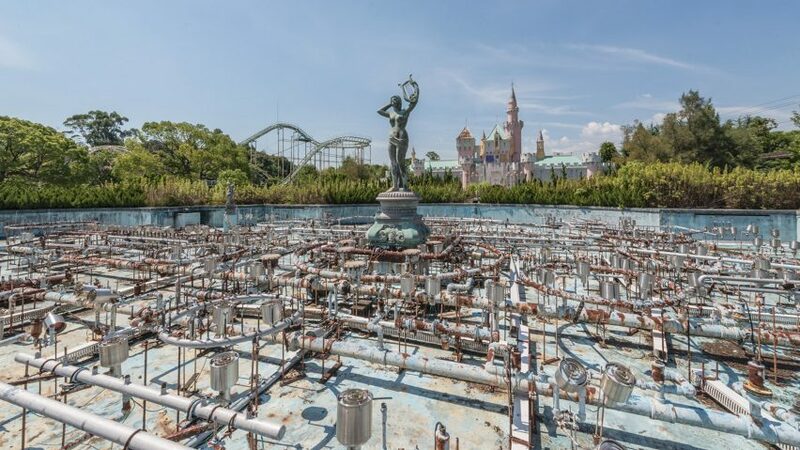 The abandoned and overgrown landscape of Nara Dreamland, a theme park closed for over a decade, is revealed in this set of images by French photographer Romain Veillon. Built in Nara Prefecture in 1961, the theme park was expected to become Japan's answer to Disneyland. But it struggled to compete when both Disney and Universal Studios opened up their own parks in nearby Osaka and Tokyo. It eventually closed in the summer of 2006, but its attractions were left in place for over 10 years – before eventually being demolished at the end of 2016. Romain Veillon visited the site before the bulldozers moved in, to show what had become of the park. His photos reveal the gradual decay of its structures, and how the natural landscape flourished once people had moved out. They show roller coasters surrounded by wildly overgrown plants, desolate cable cars, and dried-up water flumes. "All good dreams must come to an end," Veillon told Dezeen. "It was an incredible feeling to be able to explore and photograph this place over an entire day, and imagine how it was to be on the roller coaster or just to wander in the little streets of this paradise." "But I am sad that nobody can still have an afternoon back in time like me; and that Nara Dreamland will now only stay in my memory," he added. Nara Dreamland was the brainchild of Japanese businessman Kunizu Matsuo, who came up with the idea after a visit to the US. He is even believed to have met up with Walt Disney about developing it as a joint venture. The park's popular attractions included a pink princess castle, a roller coaster based on the Coney Island Cyclone, another inspired by the Matterhorn Bobsleds at Disneyland in California, and an assortment of carousels. After it closed it became a popular place for "haikyoists" – a Japanese word meaning urban explorers, particularly those interested in ruined structures and landscapes. It is one of many deserted theme parks around the world. "Nature reclaimed the park, which disappeared slowly under the vegetation, and created an even more magical and unique atmosphere," said Veillon. "But even this abandoned time had to come to an end." Veillon specialises in photographing spaces in a state of decay – the focus of his recent book Ask The Dust. Past projects by the photographer include images of a town that is slowly being consumed by the Namib desert.